Gloria and other characters are available on Amazon. Madagascar plush toys are popular with children that love the Madagascar movies. There are several characters represented and they can be found at almost any toy store, as well as Amazon. Dreamworks has released two movies in the Madagascar series. In the first, Madagascar, Marty the Zebra decides to escape from a New York zoo. His friends, a hippo, giraffe, and lion, have to escape to find him and bring him back. The zoo officials decide to send the runaways to an animal preserve in Kenya but plans go awry when some penguins change the destination to Antarctica. Chaos ensues and the four end up on an island where Alex, the lion, finds out that he is a carnivore and his friends are prey. In the second movie, Escape to Africa, the four are attempting to get back to New York but end up on an animal preserve in Africa. In fact, Alex discovers that this was the very preserve where he was born and his father is still the leader. Most children like to reenact scenes from their favorite movies and TV shows. This helps to build several skills that they will need for school, including reading. When children have their favorite characters in the form of a soft, cuddly toy, they can recreate these scenes as well as make up their own. Which stuffed toy you buy should be dependent on the child's age, character preference, and how much you want to spend. 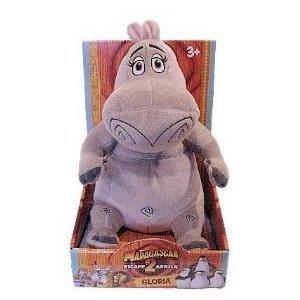 Dreamworks licensed several different plush toys based on the characters from the films. They range in price from around 10 to 45 dollars. Because the Beanie Babies are smaller than the normal-sized plush toys, they are easily carried around by the children that love them. Madagascar plush toys are perfect for naptime cuddling. Having a soft toy or other "lovey" can help your child feel more secure in unfamiliar situations, or those times where he feels lonely or sad. If the movie is one that your child wants to watch over and over, if he can quote lines, and knows all the characters, then he may love one of the plush characters.